Myrtle suffered fatal injury in an auto accident August 2000. She was on her way to shows in Oregon when she may have suffered a heart attack, causing her to lose control and cross the median. She went over an embankment and died on the way to the hospital. I interviewed Myrtle for the Sept. 1998 ShowSight Terrier issue. Long after we had finished the formatted questions, we talked, just breeder to breeder. Friend to friend. It is with profound sadness that I share this seminar again with TheDogPlace.org Readers. It also has stirred an urgency to share the knowledge, words, thoughts, and friendship of the many other great names in our sport. Myrtle started showing in Junior Showmanship in 1951 and says she was very fortunate that John and Ruth Davidson, handlers at that time, let her tag along with them and help show dogs and “be a gopher.” They gave her dogs for Junior Showmanship and she got involved with the Manchesters because they were handling them. She met Peter Rank at that time, he was nine months younger than Myrtle and going away to law school so she started showing his Manchesters. She laughs and says they were probably the youngest co-ownership in the history of dogs. He was showing Toy Manchesters at the time and they worked together, lucky enough to have a couple of other prominent Manchester people who helped them. Myrtle says that’s how she got started in the breed because she was basically a Poodle person and that’s one of the reasons she’s known for heads. She can’t stand an ugly head because of the Poodle background. Not only does Myrtle have a way with names but the list of Salutaire names reads like a Who’s Who in the breed; Word To the Wise (Top Sire, first male BIS Winner) Surely You Jest, etc. What is the single biggest misconception about your breed? "That they are terriers…. People think of terriers as an aggressive-type dog but the Manchester is not aggressive. It’s known as a “gentleman’s terrier” and I don’t expect it to spar, in fact we have it in our standard now. That’s one of the things I got put in when it was revised - that it’s not a sparring breed. We expect them to get along with other dogs. I expect a Manchester to go up to another dog and say “Hi!” not want to attack. They are good with children, Standards, not Toys of course." What is the most defining physical characteristic? 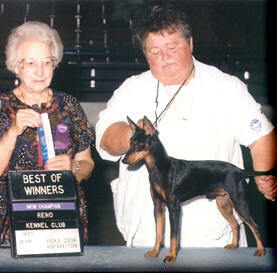 "We were originally called the Black and Tan Terrier so color and markings are very very important. Wrist markings are what sets us apart from some other terriers. Size is of course very important. And I remember Frank Burch used to say, if they have the neck, the rest of the dog will be correct. A rat-killer’s neck means they can grab and flip it up over their back and they have to have the neck to do that." Which behavioral characteristic most typifies the breed? "That they are not aggressive. That they can come up to you in a friendly way, I don’t expect them to jump all over company (they are reserved) but I want them to be able to stand there and take anything that comes along. I won’t have a shy dog." What is the most common judging mistake in your breed? "Moving toplines. Too many judges judge just “up and back” in this breed, they’re not looking for toplines going around. Our standard calls for slight rise at the loin. On a table, this will look practically flat but when you see them on the ground moving in profile, you will see the rise in the loin. Now I don’t mean a wheel-back. If you have a dog on the table that has a huge amount of topline on it, when it goes on the ground, it can move “under” itself, it’s not going to have correct shoulders, neck, or rear." Would you prefer the breed be judged standing or moving? "Moving. Because you just can’t judge the breed without seeing movement in profile. Also we’re getting too many dogs with tails way up over their backs and you can’t have the proper topline or use the rear correctly if the tail is too high. Again, it must be all one piece - and no ewe necks." What cosmetic alterations should judges know about? "Color. There are too many people out there who bleach and dye. They are supposed to have a defined “thumbprint” at the wrist. When I’m doing seminars or interviews with judges, I try to tell them how to tell if the thumbprint has been “put on” or if there’s been bleach. First, the thumbprint is never perfectly marked. In a lot of them, you’ll see a few tan hairs running through. It isn’t a perfect round circle either…. Also judges should feel the thumbprint for changes in hair texture. They should also notice if the markings are a little low. Some people get them in the wrong place. (chuckle) And some people put the thumbprints on but forget to put the pencil marks on the toes. The vent should also be checked for dye." What is of greatest concern to Breeders today? "I’d say it’s the breeders themselves. The ones that have never studied structure. Some breeders are also crossing Toys and Standards and I’m completely against it because Standard-to-Toy breeding does not have the bone, the substance, or the look of a true Standard. So I’d say the concern is the breeders not knowing their breed. If they don’t learn it, how can the judges learn it???" What is the most endearing quality of your breed? "Temperament. They’re easy to live with, they are fun dogs, easy to housebreak, they are strictly a “person dog” rather than a dog-dog. They are so attuned to your voice - it’s everything to a Manchester." What are the three words that best describe your breed? "Rat-killer’s neck. Gentleman’s Terrier. Slight rise at Loin."